This case involved a woman who thought she was being haunted by her late husband who had unexpectedly died of a heart attack in the home. It turned out that the haunting was being caused by the spirit of a young boy who had been abused in the home. His spirit was sensed in the back bedroom where he would hide from his abuser. It appears that he husband's recent death and the fact that she was now alone in the home made her more "sensitive" to the presence in her home. This was a 2 part investigation (scientific and psychic). 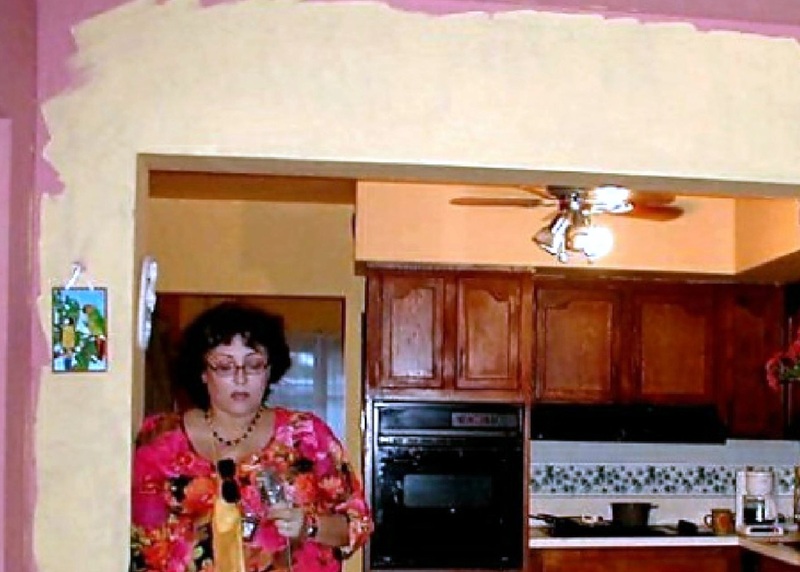 The client Lee claimed he had several paranormal occurrences in the home. There turned out to be several entities and energies that were found documented in the 2 investigations, ranging from haunted items (this client was an x-Navy officer and had collected items from all around the world) to the spirit of a deceased friend who had committed suicide. There was even the spirit of an elderly owner of the home who had passed away in the home. Read this file document to read the entire story. From my understanding, the city was established in the 1930's and the building itself dates back to the 1940's. The building houses not only the police dept but the city hall and fire station/paramedics also. According to some of the officers and dispatchers who have stayed there late at night (usually 11 pm to 5 am), a shadow has been seen walking down the halls. Sometimes they have actually thought it was a person and have gone in search of someone, and of course don't find anything. One of the officers even claimed that before he saw something, he smelled like a damp, wet cardboard type of smell, and then he saw the shadow walk down a hallway behind him. He claims even saw the reflection in a small window at the top of a door which stood ajar at the beginning of the hallway. He was so spooked that he sat outside the station all night long with the front door open, and would go inside to take calls, which weren't many since it happened around 4 am and activity is almost nil. He has since quit and went to work for another department, but he came to interview with us and give us the story first hand. On another occasion 2 officers saw the shadow going down the hallway and entering one of the offices. They both asked each other "Did you see what I saw?!" And they were so scared they weren't interested in following it into the office. After interviewing one the dispatchers who stays there over night, she claims she hasn't seen anything, but many time has felt unexplained chills up and down her neck and back when sits at answering calls, and her back is to the same hallway where the ghost has been seen. This might be related, who knows. It seems that these sightings have gone on for years, how long we're not sure, since the workforce has turned over as the years have gone by. But the stories have circulated of several personnel who have seen it. As to who the shadow might be, we considered one possibility is a police officer who worked for this department and lost his life in the line of duty around 1957-58. There was another man who had been arrested and then was shot in the parking lot after attacking some police officers, but outside of these 2 stories, we don't have an exact idea of who it might be. 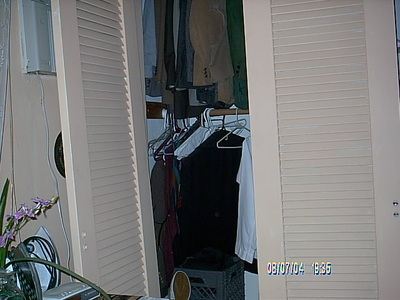 This was a case completed with John Carr from SEFGR, and psychic Mark Lewis and Luisa Velez from FPRF The occupants of the home claimed that a deceased relative was making contact through a computer and a disconnected cell phone. The main target of the haunting was their teenage son. The most disconcerting part of the investigation (personally for me) was the 2 dressed, female mannequins the owners of the home had posed in the living room. No explanation was ever given by them as to why they had them as decorations. Scientific Investigation: 26 Jan 06 - 1:30 -3:30 p.m.
Equipment: Cell Sensor Electro-Magnetic Field Detector, Craftsman Non-Contact infrared thermometer, Panasonic Palmcorder with motion sensor, Sony NiteShot Video Camera, and a Vivitar Vivicam 3715 Digital Camera. 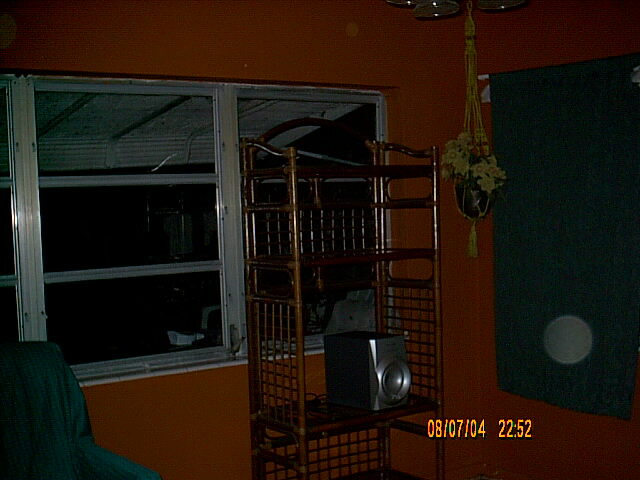 Below are the pics from the Investigation at McFatter Tech H.S. We didn't capture orbs in the areas where student Katy Lopez had, but we did capture orbs in a loft that sits over the studio (#15 & 16) and #41 is an orb on the ladder that leads up to that area. It was hard to gauge accurate temperatures in this area, because the studio and editing areas have controlled temperatures due to the equipment used. None of our equipment used for electro magnetic fields were used due to the fact that we knew we would measure too many false readings, again because of the amount of electric wiring and equipment in the rooms. We didn't feel anything unusual, except in a corner of the editing room, where no anomalies were captured. The interview with the students was informative, and they were cooperative, especially Katy, and who assisted thoroughly with the investigation. We also had a chance to speak with the teacher, who has worked there for many years. He confirmed the stories Katy had send us previously, and even told of an incident where he was at the school late at night and would hear the metal door between the studio and the editing rooms opening and slamming several times. This is a heavy door and has a distinctive sound to it. He told us the school is only about 20 years old, so we would have to research the area, and verify what was there previously. 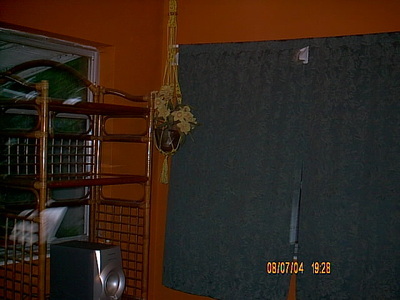 Another student described how he had once hidden behind some curtains to scare another student, and instead he heard someone pacing up to him behind the curtains (when he knew there was no one else in the studio), and of course the ghost had the last laugh. Charles Del Campo took several pics with his 35mm which he has to review in order to advise if anomalies were captured with his camera. The intent of the students, besides being a school assignment for Katy, was to confirm the possibility that there is some type of paranormal activity taking place, but they had no wish to stop the haunting, so at this time a psychic intervention is not recommended. This is an investigation where Marlene from Miami Ghost Chronicles was called in to act as consulting psychic on the spiritual intervention portion of the investigation. The family who had several small children, had moved into a new home, and had immediately started to experience paranormal happenings, including someone or something playing with the children's toys. The one spirit that was identified at the time of the spiritual intervention (after the family had completed a saging of the home), was a small boy, who appeared to have been buried in his white holy communion suit. 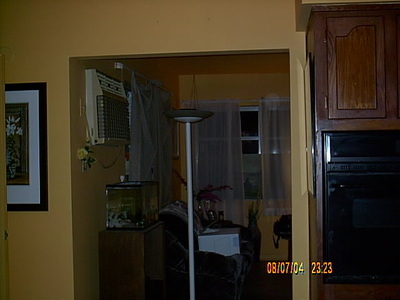 The spirit appears to have attached to the family where they were living at prior to moving to this home, which was in another city. The child was attracted to the other children, and the toys they had. The spirit did not appear to understand that he was dead, which is found to be the case with many children who have passed on, and that he had experienced death very suddenly and was unaware of what had happened to him. When the homeowner was questioned she confirmed that in the home where they had lived, a neighbor's child around the age this little spirit appeared as (which was about 7 years of age), had been instantly killed by an automobile in the street outside their home. At this point the family was unsure about sending him away as they felt sorry for him. Click HERE to read the entire narrative of this investigation. This investigation involved a family living in the area of what used to be a fishing camp on the St Lucie River which runs directly behind the home. The home had an old part, and a new area that had been build much later. Occurrences were reported only in the old part of the home. This was a very surprising investigation with ties to the most unlikely of characters as to who was haunting the home and the area right around it. When you read these articles, you will find that murder and violence riddled the life of these persons in life, so it is not surprising that they have decided to hang on and interfere with the living long after they passed from this life. Read the attached files (linked to each title), especially a recent article from March 2015 which substantiates psychic impressions reported back in 2008. All the photos and there seems to be quiet a few orbs especially outside near the pool area. As for the odd flat shaped orb near the pool seen from the back of the patio, it is seen in the exact same spot in a few other pics however, it seems it may be some type of design on the floor. The spiritual investigation was held on Monday July 13, 2015 by psychic Marlene from Miami Ghost Chronicles and FPRF member. Once inside in the hallway/living room area she immediately pointed out that something there inspects everyone coming in, feels distrust and doesn’t want to be seen or found itself. She went to the NW bedroom and noticed that a clothing hangar moved by itself. She said the word “groom” came to her mind. She also saw a shadow move in the mirror behind her. She felt unwanted there and that this is an intelligent haunting (not residual) that is using Pam as a power source. She asked Pam if the spirit has been trying to communicate through dreams/sleep or trying to make her feel fear and things that Pam realize are not her own feelings, such as severe depression. Pam confirmed. Marlene said that the spirit had been actively seeking death for a long time to get away from fear but was disappointed when realizing that death was not as expected. Pam told us she had a friend that committed suicide recently. Marlene said the words “firearm”, “bullet”, “butterflies” and the name “Nelson” came to her mind and that someone had opened a circular vortex in the house where the spirits can come and go. Pam revealed that the previous owner (George H) was a very religious minister. Marlene said this particular spirit is the one in charge and decides who of the other spirits in the house has access to Pam when they need help crossing over. She felt that the crawlspace in the attic stood out, that she could hear noise coming from there and that is where the spirits hide/hang out. We walked to the NE living room and Marlene said this was not an original part of the house and that she felt nothing there because to the spirits that place does not exist. When walking toward the SW bedroom she felt chills/touch and didn’t want to enter at first. 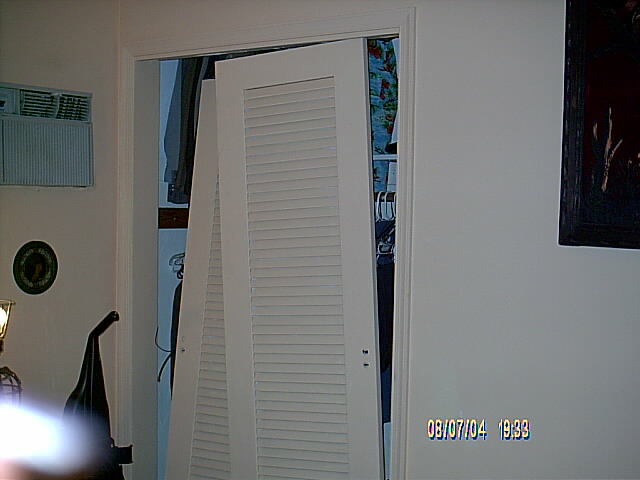 Someone had contacted negative entities in that room, which had haunted the family for a long time. Pam thinks that was the son’s room. Marlene said the spirit feels trapped in a grey area and has lost faith since the negativity in life that made him commit suicide is still persecuting him in death. Therefore he was not sure he was dead until now. Marlene also noticed other spirits. A positive old lady outside with white hair in bun and a female entity of low level negativity inside, who steals women’s stuff, that can easily be crossed over. Marlene said the high number of orbs is due to the active vortex and wanted to know if the neighbors have had any experiences. Pam didn’t think so but said Chris has experienced touch, shadows and things moving. Marlene recommended Pam not co-existing with these spirits, closing the vortex and opening a tunnel of light, and wanted to know what Pam really wants to accomplish. She explained that if the client has an underlying desire to keep the spirits then Marlene’s work would not help. Pam confirmed that she wants the spirits gone because she knows that the longer they stay the more of a target she becomes. Right after this the EMF pod started to go off like crazy because spirits are gathering from all around the vicinity trying to cross over. Marlene mentioned the name Areka, which is close to H(redacted) (George Allan H(redacted). Something lingering in the house is still connected to him, but wants to leave. Pam said she burned some sage when she moved into the house. Marlene started by calling upon the arch-angel Michael, entities of light and all other angels working in this field. She opened up a tunnel of light and asked all entities to go to the light and bring forward any person the spirits would recognize to help guide them to the light. The tunnel of light opened outside in the backyard. She asked the angels to keep us and those crossing over safe. There were many (how many?) spirits and even animal spirits crossing over. She said there are always spirits that don’t want to cross over and she can’t make them. The negative ones hide. Only thing she can do is tell them to go into another room to think about it and not bother people. The tunnel of light could not open inside the house because the vortex is still open in the house. Next we went into the SW bedroom and Marlene called upon positive energy and bringers of light to come and closed the portal and for the angels to bind and cleanse the portal. She thinks someone opened the vortex by digging a water well. These spirits are called “elementals” and neither good or bad, and have no morals. Elementals are ancient grey beings tied to the ground or mountains. Marlene threw some salt crystals in the corner of the vortex and asked Pam to plant something there as a peace offering. She explained that the vortex is like a fresh wound that needs time to be permanently sealed. Marlene asked if Rita would mind being a medium. After asking a series of personality questions she hypnotized Rita by making her relax and imagine she was standing in warm water rising up. She asked Rita what she could see behind her in a big imagined mirror. She said she could see her spirit guide but he did not say anything. She also saw an old farmer (Ben) who crying and wants peace. Rita opened another tunnel of light. He hesitated but eventually walked on smiling and saying thank you. Then Rita saw her father, who wants to move on. He asked for forgiveness, she let him go and the angels came and guided him through the light. After that there were a few more shy and hesitant spirits that slowly came forward, showed themselves and walked into the light. Finally when Marlene asked Rita to connect with the spirit in the bedroom and she looked very hard, she said she could hear an aggravated voice who said he cannot do anything about the situation and wants to stay. He doesn’t want to show himself and promise to do no harm. Rita describes him as a square piece of rock that somehow turned into a small gnome. Marlene describes Pam’s spirit guide, who is a white female who was abducted by native Americans around 1850. She has long red hair in braids and was chosen for Pam to teach her self-preservation. After that we closed the investigation for now. 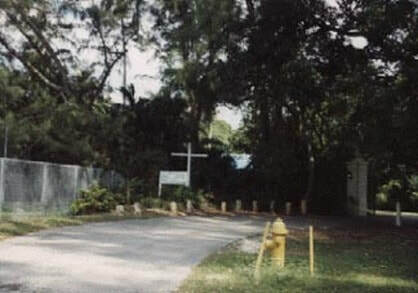 This picture was taken to an area adjacent to the field, and to the left you can see the chain link fence which separates this area from the actual field. After my initial investigation, it seems this is a cross between an urban legend and a ghost story. Supposedly this area is haunted by a teenage girl who attended a high school on the grounds. In one version she died by a drug overdose, it was intentional over a broken heart. In another version it was accidental, however after several years teenagers are still found in this area after dark looking for her ghost. I would have left this story in the urban legend category if it wasn't for the fact that it came to my attention through 2 very credible witnesses: police officers. A few months ago they were driving through the grounds late in the night as part of their patrol, since part of the grounds are very dark and overgrown. Coming up on the area in the picture, one of the officers saw what he thought was a light and a person standing there in the brush. (At this time he was totally unaware of the story attached to this place). He commented to the other police officer that he didn't know they were security guards taking care of the grounds. The other officer who had patrolled this area for a longer time advised him there were no guards around, and never had been. He then told the story that a few months back he had been alone in the squad car, doing the exact same thing at night and had come upon 3 teenagers back there. When he questioned them about what they were doing there, they told him they were in search of the girl's ghost. This same officer then remembered his own wife had attended this high school about 15 years before and even then the ghost story was being circulated. The officer who had seen something stated to me he was "POSITIVE" he had seen someone standing in the brush, but he wasn't startled or surprised because he thought it was a security guard walking through the area on his rounds. However when his partner told him the story he said every hair on his head stood on end (short as they are), and he couldn't wait to get out of there, especially after they had shone their headlight and searchlights into the area and there was no one or nothing there. ​A few days later I spoke to the officer whose wife had attended the school and we talked about getting together so his wife could give me a more detailed version of the story that was being circulated when she was a student there. Hopefully I'll be able to speak to her soon, or some other person who is familiar with the tale. I had received several emails concerning this site. It was part of the pueblo style housing that was the original master plan for Miami Springs. The house is empty now, and the major part of it has been fenced off. Stories connected to it are red lights throughout the house, a man playing in the tennis court, and unaccounted sounds. When I took these pictures, it was mid-afternoon, and as is the case when you go to a haunted site at this time, everything seems very ordinary. If anyone has a story about this site or pictures please forward them to me. This house WAS definetely haunted. I lived there for years and had dishes fall out of cupboards heard people in the long dark front hallway with front door locked saw images in the florida room and watched in disbeleife things moving in the master closet. and heard the front door slamming and it was locked, also little black blobby beingness in florida room. Ask the spanish fellow that works for the city water department that serviced the house before hurricane andrew what he knows. Hey, I was wondering if you could help me out. I just moved to New York state less than a week ago. I lived in Miami all my life. I remember my friends taking me to this manor or mansion that was supposed to be haunted. I cant for the life of me, remember the name of it though. I don't remember exactly where it was, but I do remember that it was located near triangle park in Hialeah Miami Florida. You had to go over a bridge to get there and it was a burnt down building that had a golf course on it. Legend has it that the building right behind it was an old insane asylum, and some of the people escaped. Story has it that they went over to the first building (which was used as a ritzy hotel) and they burnt it down. The top floor was, according to gossip, a dance room. They told me that when the building was burnt down there were people in the top floor, dancing, and that if you manage to sneak into the building now, you can hear people dancing above you, even though the ground on the top floor was burned and fell right through. I don't know if you know what manor I'm talking about, but if you don't, I can tell you a few more things I remember. There was what looked like a pond or canal between shrubs and over grown bushes on the side of the place. Also, there is a huge hotel behind the field where the manor sits and since its a hotel that is being used, if you park in the back of the hotel at night with your car headlights pointed at the old manor, you can see the where the windows once were, but you cant see a thing inside. Driving slowly past the manor, you can also see the whole place boarded up. The doors, some of the windows, everything. Theres a concrete archway as well if I remember correctly, that leads to a long pathway up to the front door. My friends told me that the whole place always has at least one cop, and on Halloween, there is reinforcement as far as that goes because tons of kids go and try to break in. That's all I can tell you because thats all I know. Sunday, October 25th, 2004; My best friend & I recently went to Glenn H. Curtis Mansion in Miami Springs. We read up on the story why Mr. Curtis Murded his wife & all the children in the house, but our question is, is it true about what was said, the screaming at night and the sounds of someone playing Tennis @ night??? We went out there this evening out of curiosity, not out of ignorance, out of sheer amazement... We video taped our small journey and we see for a short moment with a pause the shadown of a human figure. It might just be the video camera or what not; I wanted to know do you believe is this house haunted??? My thing as well is we did hear the sounds of children or a child.. I saw that you were intrested in the mansion. I have been out there a couple of times myself with my friends. The mansion was owned by one of the founding fathers of Miami Springs, Glenn Curtis, who allegedly died in this house. One particular night I went with my friends. We drove into the driveway about 20 feet from the main building, and stayed there for about 5 mins. The car was still running and the a/c in the car was on. I told my friend to turn the a/c off and as soon as I said that not even after a minute of silence I heard this real awful scream of a woman's voice (I was not the only one who heard it), and it sounded as so if she was standing ever so close to us. At that monement we decided to leave ASAP! It would be smart to talk to the local police before investigating the place at night because of a lot of stupid young kids trash the landmark (the fences around the house were put up recently because of kids vandalizing the place) Good luck! Above the pictures of this site...imagine my surprise to see a For Sale sign on the property, and from what I could tell...the house is empty. I guess 20 something years later this house still can't keep tenants in it. I'm hoping to dig up more stories about this house...and would welcome any stories or leads connected to it. Hey I read about the red brick house in Miami Lakes and it is very true what you said about it. It can never keep an owner. My friend use to live in the houses right by there and we always use to walk by there when we would walk her dog and that house was always for sale. It was for sale for a really long time untill it was bought. But I would say we saw those people live there for about a couple of months. Until they moved out.